It is fairly common in hospital documentation (especially ICU ward round notes to see references to a patient’s ‘trajectory’. What is this? Well, it basically reflects whether a patient is getting better, worse, or staying the same. 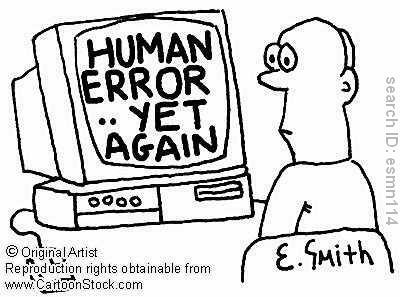 Speaking from personal experience, it is common for a patients’s initial trajectory to be wrongly estimated. 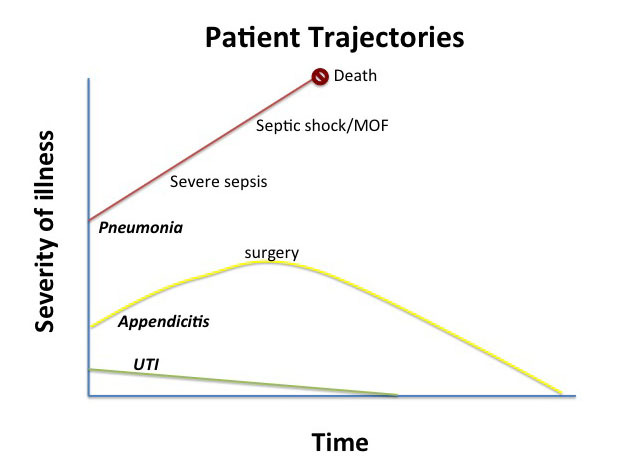 If the trajectory is OVER-estimated, de-escalating care appropriately is easy – (send ICU away, move patient out of resus etc). There are multiple ways in which prehospital care providers and ED staff can work together to make a patient’s initial trajectory assessment as accurate as possible. The decision as to whether to make a pre-hospital notification call (in NZ this is known as an ‘R40’) is often not black or white – after some experience in the prehospital setting I have been surprised at how tricky this apparently simple decision can be. Putting through an R40 has a HUGE impact on the patient’s assessment and management at the receiving end. With trauma, for example, EDs tend to have two responses and no middle ground – into resus for a full sort-out, or into acutes to take their place in the (often long) queue of ATS category 3 patients. An R40 is often the deciding factor. For the sake of example, imagine a patient from a moderate speed MVA with a sore chest, stable vitals, a cervical collar in situ, and looking pretty well. With an R40 placed, that patient will probably go into resus on arrival, have a rapid ED assessment +/- trauma call, rapid trauma views and FAST scan, and any advanced imaging will be expedited because the patient is in resus. The same patient without an R40 would be assessed at triage, and if looking well would sometimes be directed to the acutes area. This results in less frequent vital signs, a delay to assessment by a doctor, vastly slower diagnostic imaging, and in the event of a deterioration the barriers to escalation listed above would come in to play. My suggestion to prehospital providers (and what I do when I am working in the prehospital setting) is, if you have a ‘grey area’ patient and are actually weighing up between doing an R40 and not doing one, just do it anyway! On behalf of ED, we would rather the threshold is low, because it is much easier to de-escalate care than escalate it. Even if a patient is triaged to the acutes area (not resus) after an R40, the patient is still mentally ‘tagged’ by the ED supervisor and charge nurse as potentially needing a closer eye than they would otherwise have got. Don’t underestimate the effect of an R40! The classic example of this in current paramedic use if the prehospital ECG. It doesn’t make much difference to how a paramedic manages the patient, but if a STEMI is identified prehospital and a notification made before the patient arrives in ED, the door to PCI time is considerably reduced. 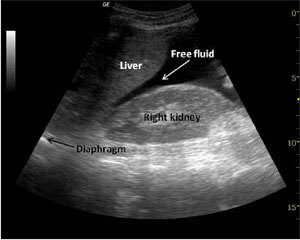 Prehospital ultrasound has a major role to play in the same way. In the setting of trauma, a postive prehospital FAST scan may, for example, mean the patient is met in resus by the trauma consultant while an OR is being made ready, instead of the trauma team being represented in resus by the junior surgical registrar (Note – no disrespect is meant towards junior registrars here, we have all been there!) Minh Le Cong recently tweeted about a patient who had an in-flight scan demonstrating a ruptured ectopic pregnancy. ED was bypassed and the patient went straight to threatre – the ultimate in streamlined care! 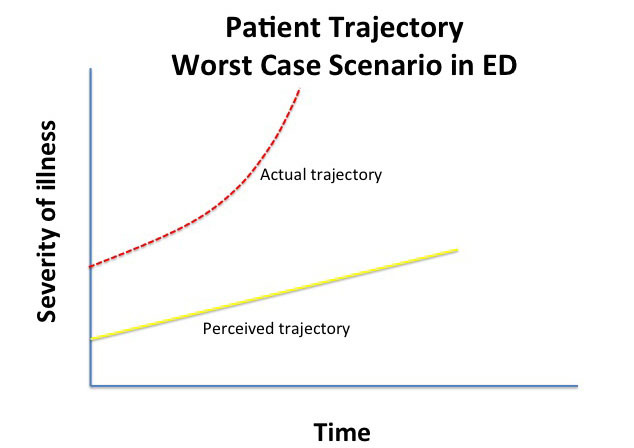 I am aware that there is some healthy skepticism among paramedics regarding ultrasound use prehospital, and I am certainly not advocating that they defer their usual interventions or prolong the prehospital phase, but if in the future they gain ultrasound skills they will acquire a lot more influence on the patient’s downstream care. Smartphones are now almost ubiquitous, and some prehospital providers have started taking photographs of prehospital scenes, wounds etc. This is very helpful for the ED team! As an example, I recently looked after a patient from a moderate to high speed MVA. He had an obvious significant limb injury, and was complaining of MILD chest and back discomfort, but appeared clinically well and was haemodynamically stable with normal trauma views. We were weighing up whether to perform a chest/abdo/pelvis CT, and after seeing the pictures of the scene that one of the paramedics had taken (revealing unrecognizable vehicles and a patient literally centimetres from death!) on an iPhone, we elected to perform the scan. We found multiple unsuspected injuries, which had the potential to make the patient unstable in theatre while his limb was being operated on. Without the additional prehospital information proved by the scene photos, we may have elected not to perform the scan. Even for a relatively short prehospital phase, prehospital providers will have spent far more time with the patient than a triage nurse will. They will be aware of circumstances leading to the request for an ambulance or helicopter (mechanism of injury, for example), have performed an initial clinical assessment, and (perhaps more importantly) will have observed trends over time. They will also have their own clinical ‘gestalt’ or ‘gut feelings’ regarding how unwell a patient is. If prehospital staff are handing a patient over at triage or in an acutes area, (without a prehospital notificaton call) they will typically be dealing with a nurse who has multiple competing priorities. Spending 5 minutes with a triage nurse on a Friday evening should convince even the most hardened skeptic of this! Prehospital staff should also feel free to offer their ‘gut feeling’ to the staff they are handing over to. If someone with a bit of experience says to an ED doctor “his numbers are ok but he looks pretty s$%# and I have a bad feeling..” they are guaranteed to get attention! ED doctors have a healthy respect (usually acquired the hard way) for bad ‘gut feelings’. 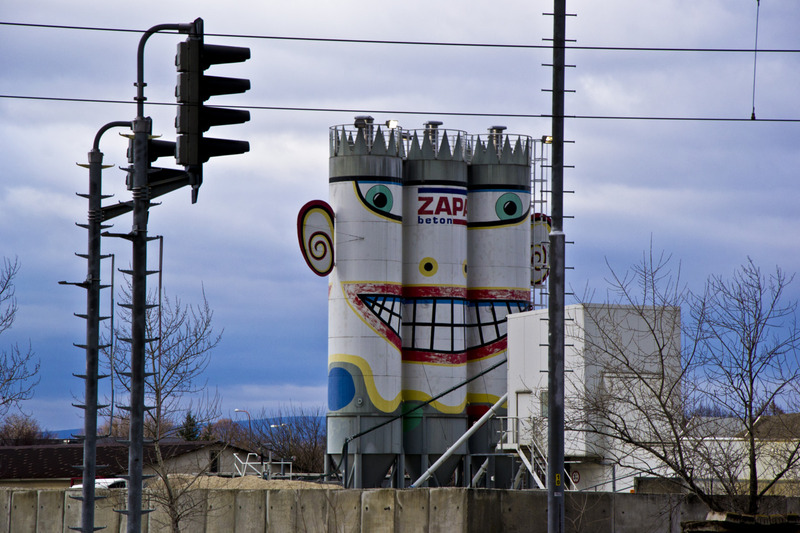 Who needs broken silos when you can decorate them instead? This particular phrase has a lot of traction among hospital management at the moment, and while some hardened skeptics will dismiss it as ‘MBA wafflespeak’, I think it is actually critical to patient care. The advent of Auckland HEMS seems to have gone some way towards achieving this, as discussed in this post, and more communication and collaboration between healthcare services can only be good for our patients. Working in the prehospital setting has not only taught me new skills (mostly learnt from my paramedic colleagues), but has provided me with a new perspective on EDs and the risks to patients that come from current systems. Personally I would welcome more paramedic presence in ED, both in training and at post-graduate level. Paramedics already play a critical role in patient care, but I wonder if they realise quite how significant an impact their patient assessment and handover communication has on a patient’s downstream care in an imperfect, frequently overloaded hospital system? Posted in Prehospital-ED interface	| Tagged CRM, handover, whiteboard	| Enter your password to view comments.